In some ways, Eysses prison is ground zero for sweeping government plans to reform France's penal system. But is it the right way to go? Elizabeth Bryant reports from Villeneuve-sur-Lot. Jean-Claude is uprooting the last of the winter greens. Afternoon sunlight slants down, taking the edge off the chilly air and casting a shadow of Jean-Claude — stout, ruddy and clad in a red, checkered shirt — over the newly tilled earth. "I was always into farming, I love anything that deals with the earth," he told DW. "So to be able to have a garden and to growth things, that's the way to live." The small plot of land he is working is not a farm garden, but part of the sprawling grounds of Eysses prison. Perched on the outskirts of the medieval town of Villeneuve-sur-Lot, the southern French jail is, in some ways, ground zero for sweeping government plans to reform the country's penal system and tackle one of Europe's highest rates of prison overcrowding. "Each prisoner has both rights and obligations," says Eysses detention head Philippe Sperandio, outlining the rules of an experimental program known as Respect, which was rolled out at Eysses a year ago. While it is too early to assess its success in lowering recidivism rates, Sperandio told DW that, "we see a drop in physical violence among inmates, and there are fewer infractions." Announced by President Emmanuel Macron in March, the new reforms aim to offer alternatives to costly and debilitating 24/7 incarceration. In some cases, they will swap short-term sentences for options like electronic tagging. Read more: Emmanuel Macron — French savior or tormentor? But there are also plans to build 7,000 cells over the next four years to ease overcrowding — and reinforce probation and re-insertion programs for an inmate population that has soared from 48,000 in 2001, to nearly 70,000 today. A prolonged prison guard strike earlier this year intensified pressure for speedy government action. 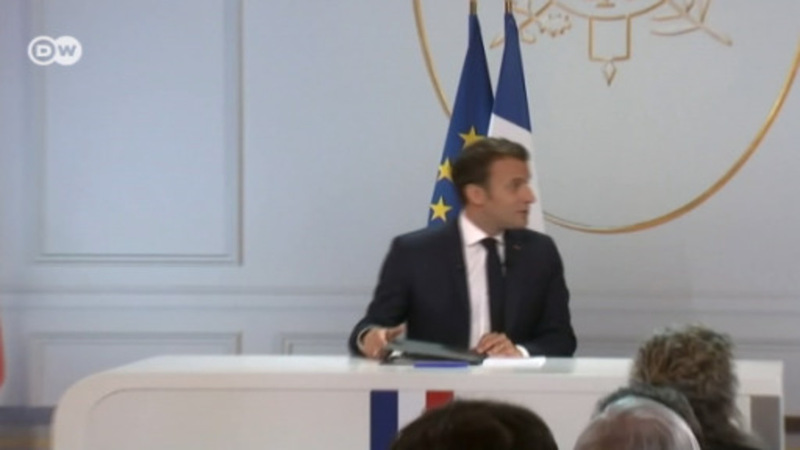 "Sentences must be credible and understandable, not necessarily in terms of being the most severe possible," Macron said in a speech not far from Eysses, as he described the new measures as "anything but laxism." Still criticism has been swift. Some denounce the measures as too soft on crime; others suggest they don't go far enough in addressing radicalism flourishing in French jails. A poll last month found half of French respondents support less liberty and tougher conditions for prisoners. "A large part of the population sees prison as a place synonymous with suffering and punishment," Chloe Morin, of the Paris-based Jaures Foundation which helped sponsor the survey, told French radio. Yet others praise experiments like the one underway at Eysses, which is based on a Spanish model called Respect. "Instead of treating prisoners like children, Respect makes them responsible," says Jean Luc, who has spent nearly three decades behind bars and was among the first Eysses inmates to enroll in the pilot. "I'd rather spend eight hours a day with my hands in the earth, than in bed under the effects of some medication," he told DW. The 18 prisons that have launched Respect since 2015 also report a drop in suicide rates. Another 20 are expected to introduce the experiment over the next two years. Respect is run in only one wing of Eysses, and getting into the program is competitive. Those admitted spend 25 hours weekly either working, or participating in health-related and educational activities. They also have keys to their own cells, a powerful symbol of limited liberty — even if guards have copies. Detention head Sperandio recounts one departing veteran telling him he'd never experienced anything like Respect before. "Will that help ensure he won't come back? I don't know," he added. "But he sees things differently. He knows what he's lost." The pilot project has also helped to build better relations between prisoners and staff. "I am very rarely confronted by violence, we're a lot more relaxed," guard Carole Cerjak, who spent part of an afternoon playing boules with several inmates, told DW. "You see a prisoner coming here, and a week later, they're completely different." A step forward — or back? Still, some experts say the Eysses experiment is not an advancement, but rather a step back to a more open French prison system of earlier years. "Now the doors have been reopened, but only for a few," Marie Crétenot, of the International Prison Observatory's French chapter, told DW. Not included in "open" experiments are France's roughly 1,600 radicalized inmates, whose numbers have swollen with returning jihadi fighters and those linked to attacks at home. For them, the government's answer is building more cells and isolating prison blocks to stop radical Islam from spreading. Even so, "the idea is not to ostracize them so they leave embittered," said Justice Ministry spokesman Youssef Badr, describing small units and one-on-one attention for radicalized inmates. "There's real effort made to rehabilitate them." But leading prison expert Farhad Khosrokhavar is skeptical. "They stress the repressive side and not the integration side," he told DW. "And that is the attitude, I would say, of many European governments nowadays." At Eysses, inmate Jean-Luc compares his current conditions to previous prison stints in northern France. "I've been in some where a dog wouldn't enter. There are rats, there are cockroaches, there are six people to a cell." Today, he is planning his next move — when he will finally be a free man. "I'll be retired by then," he mused. "And what will be most important is a plot of earth to cultivate." The French president has bowed to yellow-vest protesters with tax cuts and administrative reform. He's hoping for a new start — but his fight for the hearts and minds of the people is far from over, writes Barbara Wesel.